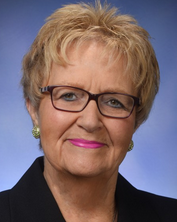 Current representative: The current representative for the 38th District is Rep. Kathy Crawford (R-Novi). The district includes Lyon Township, part of Northville city, Novi city, Novi Township, South Lyon city and Walled Lake city, according to the House Republicans. According to her official website, Crawford "was one of the founders of the Michigan Association of Senior Centers." She also previously served as a Novi City Council member and an Oakland County Commission member. She was first elected to the House in 2014. Rep. Crawford raises money through a candidate committee, Friends of Kathy S. Crawford. She is also connected to a PAC, the Oakland Leadership Fund.